A new year, a new chapter! This time of year is always exciting: youngsters are in training, foals will soon be arriving, and breeding plans are being put together for this season. This year we are excited to have two foals on the way by the newest member of our family, ECP Anchor Man (LPS The Boogie Man x Minion Marquisse). Last season we had chosen “Sailor” for two of our mares and after they were well in foal we had the chance to purchase this handsome guy. With the passing of our foundation stallion HVK Man About Town in September, the timing couldn’t have been more perfect for us to add ECP Anchor Man to our program. “Sailor” has been a delight to be around, enjoying “retired” life at the farm since we brought him home from the New England Regional in late July. 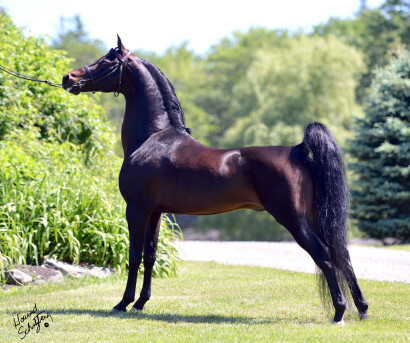 He ended his winning career there by taking the Grand Champion Stallion crown home for a second year. We plan to offer his services to the public this year and with great anticipation await the arrival of “Sailor\’s” offspring. So here’s to the newest chapter in our program and great expectations for 2015!